After the beginning of Operation Iraqi Freedom Tamiya decided to release a series of model kits of vehicles, which participated in this conflict. The only completely new models released were US Humvees and the JGSDF Light Armored Vehicle, which is used by Japanese Iraq Humanitarian Assistance Team. Challenger 2 model was almost entirely new, but it used lower hull and some suspension parts from old Tamiya Chally 1 model. M1A2 Abrams model included new turret and tracks, but the hull, suspension and wheels were from previous M1A1 releases. M2A2ODS Bradley kit included even less new parts and most components came straight from old M2A2 kit. 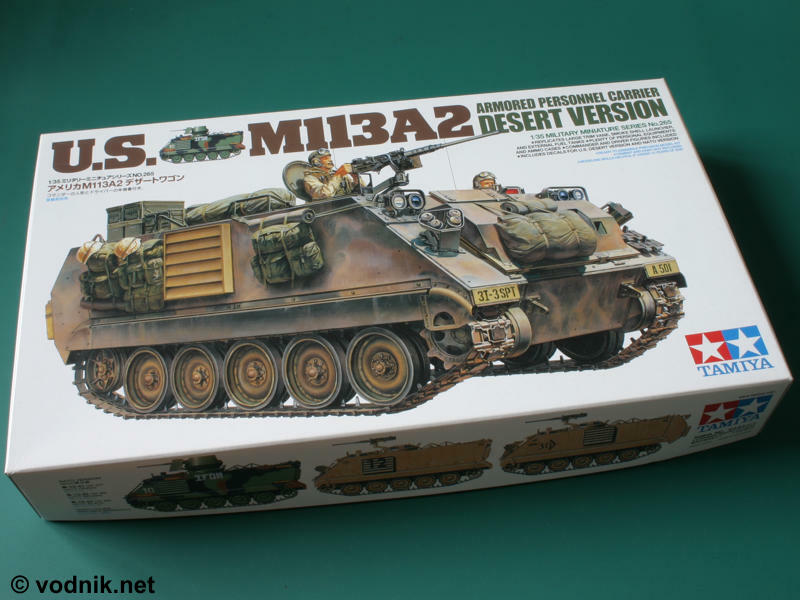 M113A2 kit reviewed here is quite similar in this aspect to ODS Bradley kit. It is 30 years old (!!!) M113 kit with some new parts and accessories included and new decals added. First M113 Armored Personnel Carriers (APCs) were manufactured in 1960. The vehicles were able to carry 11 soldiers plus a driver and track commander under armor protection across hostile battlefield environments. They were powered by the 209HP Chrysler 75M gasoline engine. The first major upgrade came in 1964 with the introduction of the M113A1 package which replaced the original engine with a 212 horsepower diesel package. Continuing modernization efforts led to the introduction of the A2 package of suspension and cooling enhancements in 1979. Externally new A2 vehicles were recognizable by slightly higher ground clearance (17" instead of previous 16") and idler wheels raised two inches, what noticeably changed the way tracks lie down on wheels. Shock absorbers were added to second road wheels (previously shocks were only attached to first and last road wheels). Other visible change was the new vertical exhaust pipe with rectangular metal guard and hinged cover. Today's M113 fleet includes a mix of these A2 variants together with other derivatives equipped with the most recent A3 RISE (Reliability Improvements for Selected Equipment) package. The standard RISE package includes an upgraded propulsion system (turbocharged engine and new transmission), greatly improved driver controls (new power brakes and conventional steering controls, i.e. yoke instead of previously used tillers), external fuel tanks (optional in M113A2, but never used on personnel carriers by US Army, only on some specialized versions like M981 FIST-V and M1064 mortar carrier - now are installed as standard in all M113A3s), and 200 AMP alternator with 4 batteries. Additional A3 improvements include incorporation of spall liners and provisions for mounting external armor. Tamiya kit comes in a Tamiya usual top opening box with nice box art illustration on the lid. 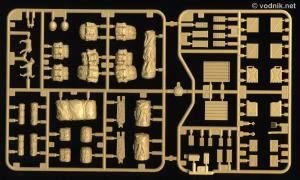 We get five sprues of dark yellow plastic, separate hull tub part, vinyl tracks, poly caps, decals and instructions. 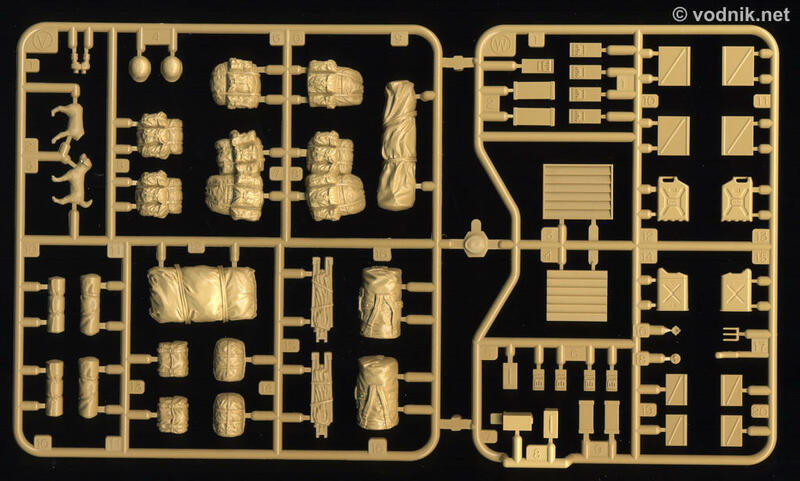 Parts sprues are packed individually in plastic bags. Folded instructions contain 12 easy to follow construction steps with clear illustrations. 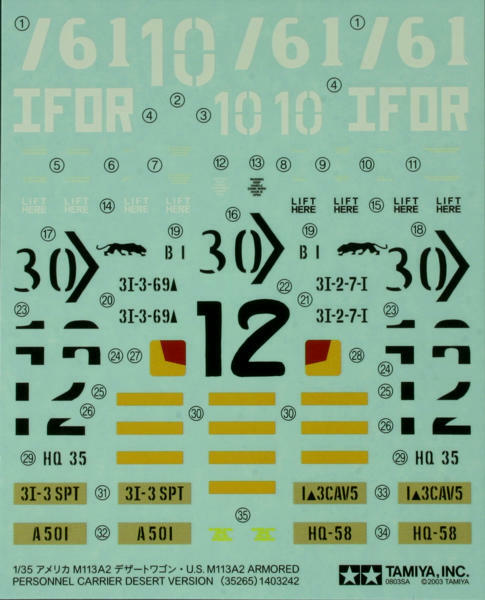 There are four marking options provided in the kit, all for US Army tracks - two in NATO camouflage (from OIF and Bosnia) and two in desert tan color (both OIF). Two of featured vehicles had external fuel tanks attached, so these were actually M113A3 vehicles, not M113A2. 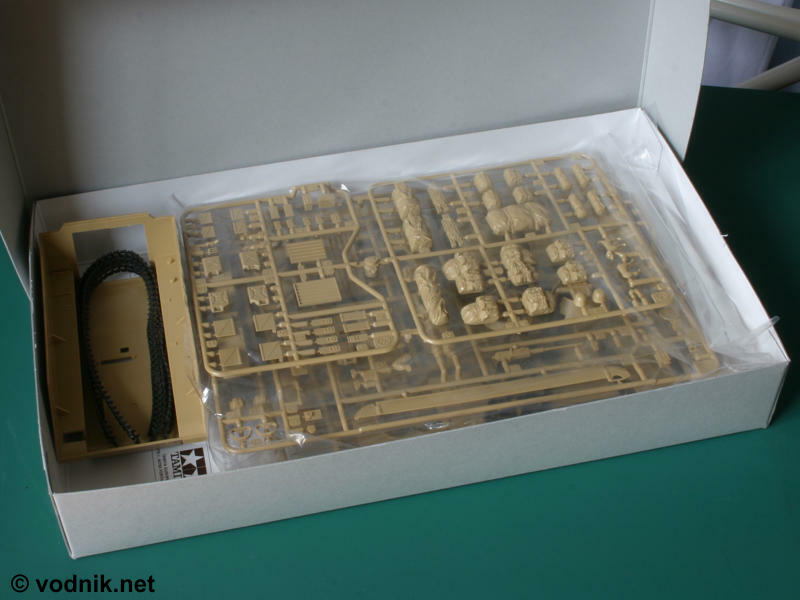 Sprue A contains mostly suspension parts and while it is still dated 1974 on one of the runners, it was actually slightly modified for current kit release. One part was added to it, i.e. fuel filler cap, which was molded on hull top in previous Tamiya M113 kits and now is a separate part. Road wheels were modified and now feature raised rim edges. I'm not quite convinced whether this change was really necessary. It makes painting tires easier, but on many pictures of real M113 vehicles it can be seen that rim edge is usually flush with the surface of the rubber tire and no raised edge is visible. Of course kit wheels can be easy modified by sanding those edges off if someone prefers previous look of wheel parts. Wheels are attached to suspension arms by means of poly caps, what is usual method in Tamiya kits. 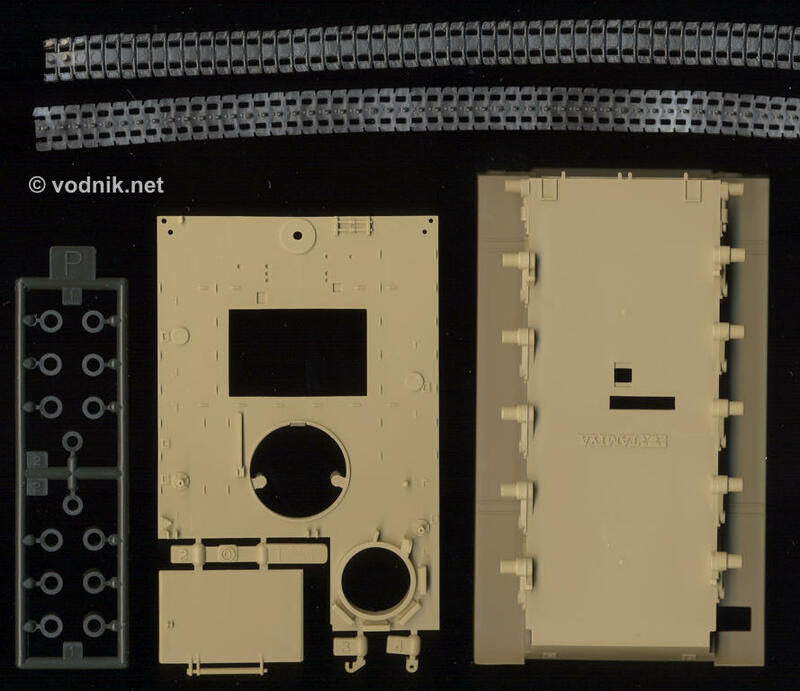 Sprue B was not modified at all and it is exactly the same as it was first molded in 1974 release of M113 kit. Sprue C is actually just a hull top plate with cargo hatch and its hinges. As mentioned earlier hull top plate was modified by removal of fuel filler cap and another modification is addition of very faint molded-on triangle, which shows the position for personnel heater exhaust pipe, provided as separate part on sprue F.
Sprue E is completely new and it includes new larger trim vane with separate floatation box, smoke grenade launchers, commander's cupola and gun armor shields, narrower track skirts, two shock absorbers, external fuel tanks, new M2HB machine gun, Combat Id. 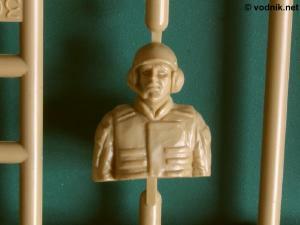 Panels (CIPs) and two figures (full commander's figure and half-figure of the driver). 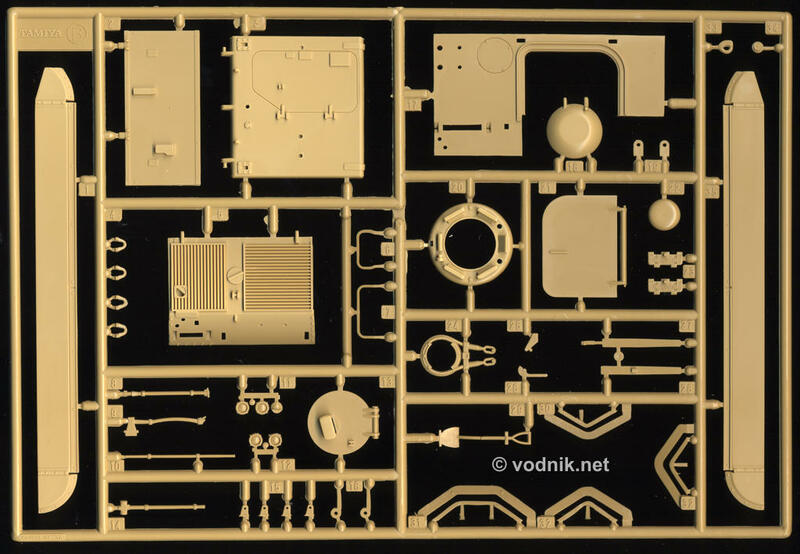 Sprue V is taken from Tamiya's US equipment set and includes a number of stowage gear to give the model a busy look, typical to US vehicle during OIF. Hull tub part is almost the same as it was 30 years ago, the only difference being the addition of faint molded-on line showing the position of shock absorbers over second road wheel arms. Unfortunately, and this is probably the biggest weakness of Tamiya M113A2 kit, tracks included are still the same vinyl parts from all their previous M113 family kits. This means that you have to use heated metal to join their ends, as they are not glueable. They lack any details on inner sides and outer sides also leave a lot to be desired as far as accuracy is concerned. Unfortunately Tamiya decided to omit the interior parts in this release. Parts from old Tamiya M113 kits could still be used, but a lot of modifications is needed to update them to M113A2 or M113A3 standard. Using parts from Academy kit should also be possible, but these would also require some changes, particularly to build A3 variant. Parts in the kit have very nice and crisp details molded on them, even those designed 30 years ago. Ejector pin marks are kept to minimum and hidden in places were they shouldn't be visible on finished model, with exception of those on inner sides of all hatches, which need to be filled if you don't plan to build your kit buttoned up. Minimal amount of flash is present on some 1974 legacy parts and no sink holes are present. 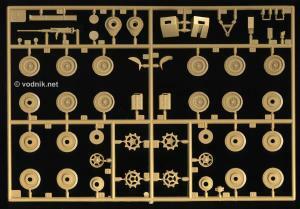 Sprue A. Note fuel filler cap part added on the right bottom of the picture. You may also notice raised rim edges added to road wheels. Click on picture to enlarge it. Sprue B. 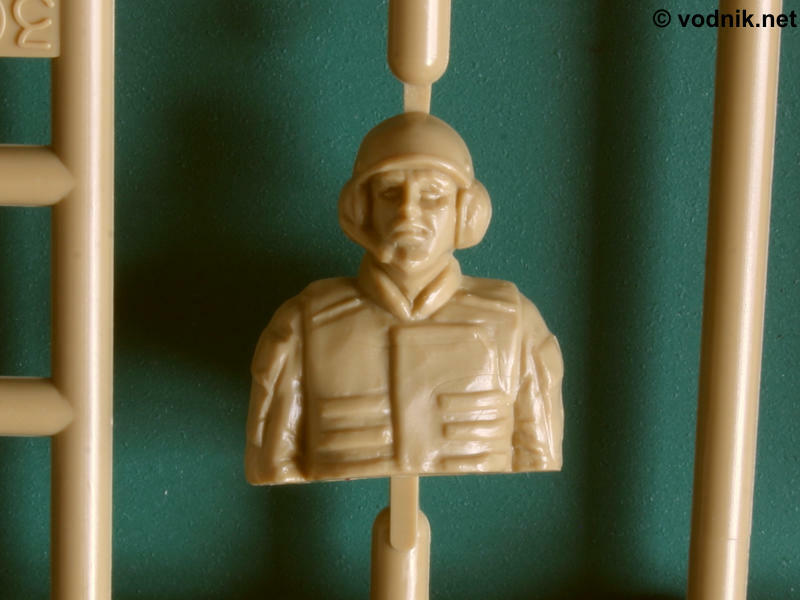 This sprue was not changed since it was first molded in 1974. Sprue C (hull top and cargo hatch + hinges), hull tub, tracks and poly caps. Note featureless inner side of tracks. Fuel filler cap molded integrally on hull top in all previous Tamiya M113 family kits was now removed from this part and is a separate part. Click on picture to enlarge it. 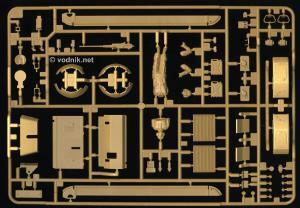 Sprue E. New parts added to M113A2 release of Tamiya kit. 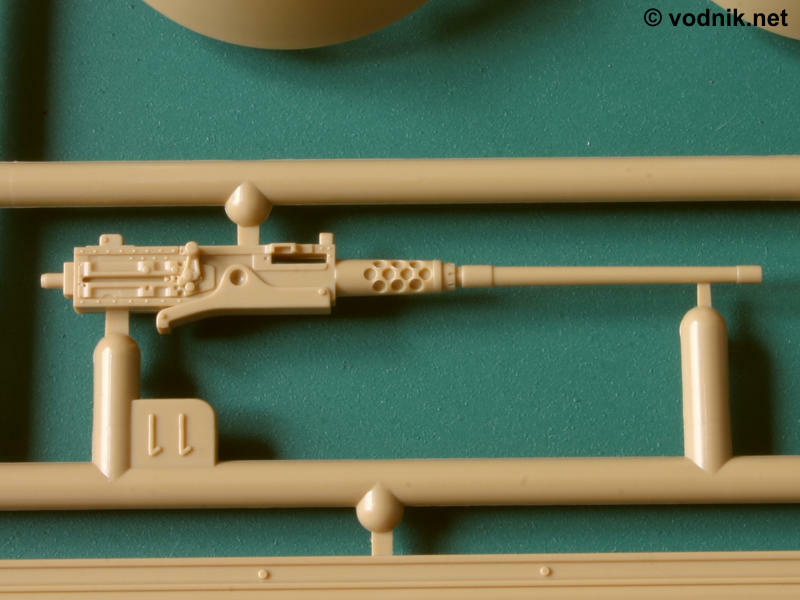 Sprue V comes from the US modern equipment set. Tamiya added it to all their recent model kits of US armor. Click on picture to enlarge it. 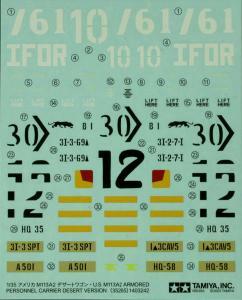 Decal sheet. Two figures included in the kit are wearing current Interceptor body armor. Details are a bit soft on them, but they are quite usable. - the suspension is of M113 / M113A1 type. Tamiya added parts for two additional shock absorbers, but have not changed positions of road wheel arms and idlers, so tracks will be too flat, while in A2 and A3 vehicles the upper run of tracks is hanging more in "U" shape. - the engine exhaust grille is one rectangular part, as it was in very early M113's. Most M113's and all later variants had split exhaust grille with narrower part near the edge of the hull. - headlights are attached directly to hull armor parts, while in M113A3 there are additional thick armor plates added under headlight mounts. Configuration in the kit is however correct for M113A2. - there are no provisions for mounting external armor on hull parts, which were added to M113A3 vehicles. Again kit parts are correct in this aspect for M113A2. On side hull armor of M113A3 aside from armor mounting provisions (threaded holes with blanking bolts in them) also added were tie downs for strapping crew gear on and these are missing from the kit as well (they are also missing from the vehicle painted on box art). - the hinges and latching mechanism for door in rear ramp are not correct for M113A3, but are fine for M113A2. - left rear track guard part in the kit has a drain channel in it. This part is only used in M113A2 variant (M113A3 has fuel tank in this place), but is not accurate. Drain channel was only present in M113 and early M113A1 vehicles, but late A1s and all A2s had flat left track guard, similar to the right side one. 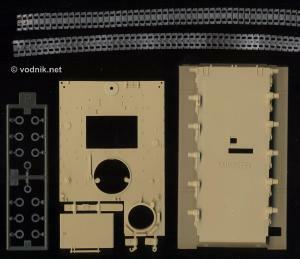 - there is a part for engine grilles water screen included and instructions show it attached above trim vane for all marking/configuration variants that can be built from Tamiya kit. In reality such screen is only used on M113A3 vehicles and should be omitted in M113A2 model - shovel should be attached in this place instead. As you see to build reasonably accurate M113A3 from the kit a lot of additional modifications have to be made. It is easier to build M113A2, particularly if you choose to ignore suspension inaccuracies. After all the kit is called M113A2 on the box! You can still add provided external fuel tanks to your model, even if you decide to build it as M113A2, but it cannot be US Army vehicle. Some foreign users of M113A2 however use them with such tanks attached, so all you need to do is to find some interesting markings for such model, as in the kit you only get US Army decals. If however you want to build US Army vehicle and do not plan extensive modifications to kit parts, you have two choices: either you put external fuel tanks and engine grilles water screen part (E24) into spare parts box and build acceptably accurate M113A2 or you attach those parts and call the model M113A3, accepting the fact that it actually is not really it. New M2HB part from sprue E - much more detailed than old part, which is still present on sprue A.
Click on picture to enlarge it. Partial figure of the driver. Currently Academy M113 kits are regarded the best models of this vehicle in 1/35 scale. Recent Tamiya release, while very interesting in some aspects, didn't change this fact. Some parts in this kit are much nicer then those in Academy kits (like decals, external fuel tanks, new machine gun parts, crew gear etc. ), but others clearly show their age and are inferior to those in Korean manufacturer's kits. The worst parts are definitely tracks, which are simply the worst M113 tracks on the market and there is really quite a lot replacement choices in this area now. Several manufacturers offer individual link tracks and AFV Club now also sell very nice one piece vinyl tracks. The lack of interior parts is also a big disadvantage of Tamiya model. Very nice model can still be built from Tamiya kit, particularly if you use the stowage gear included to give it a busy look, but for more accurate M113A2, Academy kit is still a better starting point. And to build accurate M113A3 you need to be prepared for making a lot of modifications regardless of the kit you choose to use. Review kit was purchased and received from Japan at light speed thanks to excellent service of RAINBOW TEN online store.